he Insider Picks team writes about stuff we think you'll like. Business Insider has affiliate partnerships, so we get a share of the revenue from your purchase. I'm never willing to spend more than five minutes on breakfast, which means I spend a little too much at corner stores on bacon, egg, and cheese sandwiches. I got the Hamilton Beach Breakfast Sandwich Maker ($24.99) on Amazon because it makes breakfast sandwiches at home in under five minutes and has over 3,000 five-star reviews. It looks gimmicky, but it's surprisingly convenient. Below I'll walk you through what it's like to use one, but you can also shop it directly here. For the last couple of decades, I have not been a "breakfast" person. Even when I was, breakfast was never permitted to be more time-consuming than adding milk to cereal. The loophole, though, is getting a cheap device to do the handiwork while you sit back and reap all the benefits. If you're into the morning celery juice trend, that may mean a juicer. 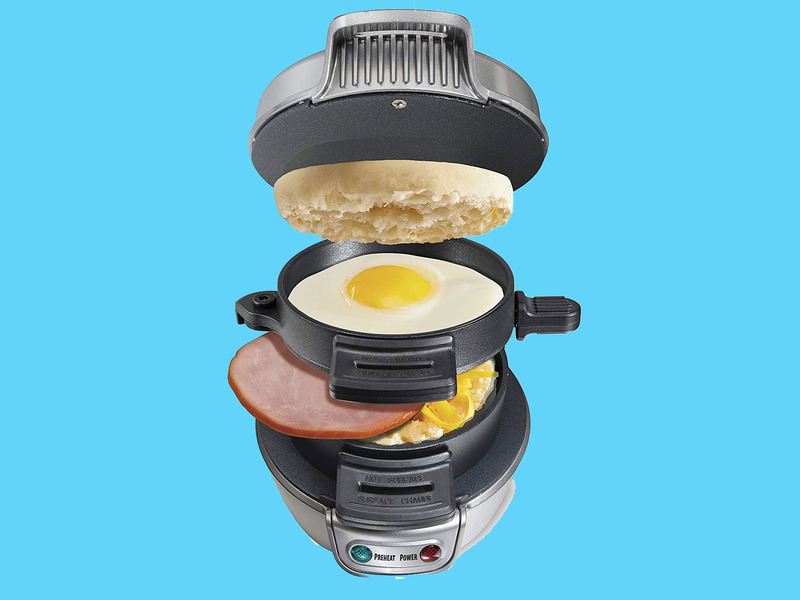 If you're more likely to spend $20 every week buying overpriced egg and cheese sandwiches from the corner store, that may mean the Hamilton Beach Breakfast Sandwich Maker ($24.99). I went with the latter. Mostly because it's tiny, easy to clean and operate, and makes a breakfast sandwich in under five minutes. It also doesn't hurt that it has over 3,000 five-star reviews on Amazon, even though it sort of looks like a TV infomercial gimmick or something a genius eight-year-old would brainstorm. In exchange for $25, I now know what's in my food, save money on buying my own fresh ingredients, and factor in fewer stops on my way into work in the mornings. It hasn't completely converted me into a "breakfast person," but it does mean I save money, time, and eat better when I do opt for one. It's also a major bonus that it doesn't take up tons of real estate in my shoe-box kitchen. And if you're cooking for two, there are dual models ($39.99) (which are basically just two of these machines sandwiched together).